That's a gorgeous shot! I need to get my camera out again, and just start taking pictures. It's been awhile. Such a detailed shot. 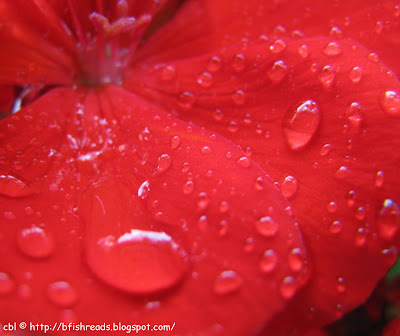 I love to see raindrops on flowers and catching them on camera. Normally I can say a lot of words but this picture leaves me just saying - Oh, my god! Gorgeous shot. I wished you or Cathy were here when I saw the baby birds last week. This is lovely. I love the raindrops on the petals. Very nice - beautiful deep red color, and love the water drops! Makes me think of The Sound of Music. Good to know where you are you have reached that place called AFTER the rain. It's like Gotham here. That is a great photo! I have a thing for water droplets on anything. I think it's so beautiful and the deep red color just accents the droplets. Another great flower closeup - you are really good at it. Beautiful! I love droplets!! I have a hard time with the my camera picking up the red colors, yours looks brilliant. Rain just brings such a tranquil peace to my spirit. That is SUCH A BEAUTIFUL pic... the color is sooo vibrant. I can almost taste the droplets. Gorgeous macro shot! I love these kinds of photos. I just joined a local photography group so I may be posting some Wordless Wednesday shots soon, too. Of course, don't expect them to be as lovely as yours are! You could make notecards out of some of your photos - beautiful! Beth - that is GORGEOUS! I want to blow it up and frame it! My hubby and I are saving for a nice camera and I am SOOOO writing you for advice, if you don't mind that is! I want to take beautiful pictures like you!